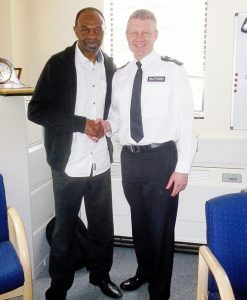 James Cook MBE with the Borough Commander of Hackney. As I stood outside Rectory Road Overground Station at 12.45 on a Thursday afternoon in April 2016 waiting for former British & European super-middleweight champion, James Cook MBE, a grey Fiat parked up at the kerb. Two young men emerged from the car and remained on the other side of the pavement railing, holding a conversation in a language that I took to be Turkish. A black teenager came strolling down the street and, as he passed by, the trio instantaneously fused into a hostile triangle of testosterone-fuelled posturing and projectile glares. I was a mere few feet away, but I felt in no personal danger as the three of them only had eyes for each other. The menacing exchange lasted for the briefest of moments, but the intensity of the display made me feel grateful for the metal barrier that separated them. When James arrived a few minutes later, we headed off to Stoke Newington Police Station to meet with the Borough Commander of Hackney, Detective Chief Superintendent Simon Laurence. Our mission was to discuss the Independent Advisory Group (IAG). Every London borough has an IAG, consisting of police officers, including the respective Borough Commanders, and representatives from the local community who are termed as advisers. Meetings are held on a quarterly basis, and an open line of communication is maintained at all times. The key objective is for the Met Police to gain a deeper insight into the mood on the street generally and obtain guidance on various cultural matters. 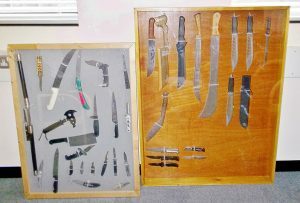 Knives confiscated off the streets of Hackney. 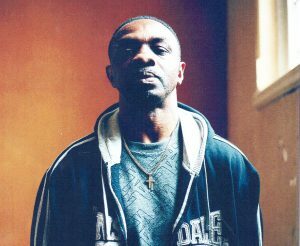 Guardian of the streets of Hackney. I am hoping my two professional footballers in Kosovo can come and see you and provide input to the football initiatives as to guests who are 21 and 25 as Khalid Basit, (25) and Abdul Bashiru (13) as striker and forward from Ghana Dreamteam on youtube and now at FC Pristina. I met them for my 70th birthday and from there I thought how could we at Pedro Cluyb network with footballers. I am proud that the words of Youth Justice are positive as there is a chance for kids to learn to evade enticement into crime. Pauline Badger. Patron – 2011 to the present.